Private with easy access to Eastman's amenties. This is wonderful Eastman home that has a rare 3 car garage, a very private location and yet you're less then a mile to the activity center and South Cove beach. 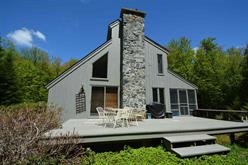 The lot is almost 3 acres and you can access the cross country ski/hiking trails right from the back yard. The home features vaulted ceilings, dedicated office space, a modern kitchen with GE stainless appliances, updated master BA, walk in closets, lower level game room with sliders to the back yard. A nice size wet bar with granite tops, a wood stove with a stone chimney really make this family room a winner!! A awesome screened porch that ties into the southern exposed deck expands the living space for warmer weather entertaining. New Hampshire is very tax beneficial state and Eastman is a half hour drive to so many opportunities to take advantage of in the Dartmouth/Lake Sunapee region.